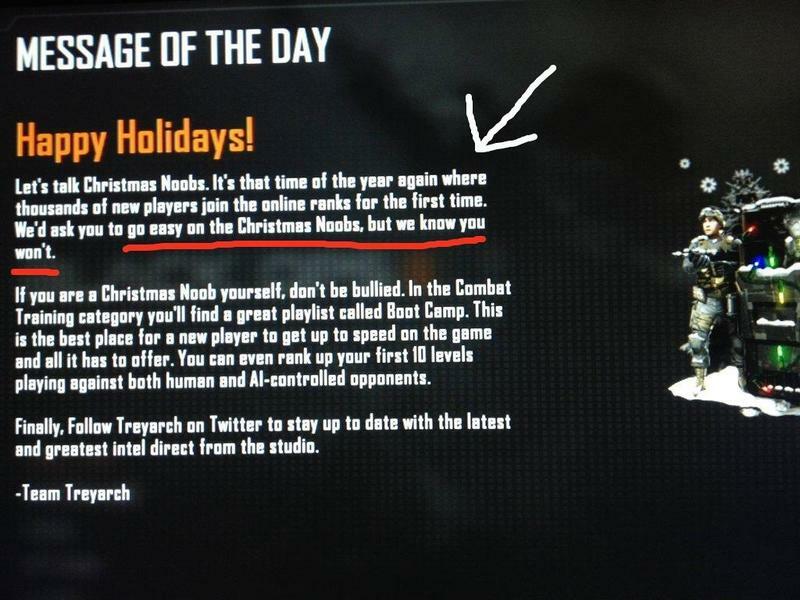 Treyarch: Take it Easy on the Call of Duty "Christmas Noobs"
Call of Duty: Black Ops II has reached over 7.5 million homes since it launched and is already one of the most successful video games of all time, shattering release records at nearly every turn. Naturally, with sales figures like that, plenty of kids and new comers who want to try a piece of the action will be available for slim pickins. Treyarch wants you to set aside your primal instinct to massacre these fledglings and give them a chance to enjoy the game before you totally turn them off forever. Nobody likes to lose at a video game, and countless deaths piling up one on top of another will lead to many of the newly initiated into a quick return to GameStop. Looking to prevent this exodus, Treyarch has released a humorous plea to the Call of Duty gaming community, asking them nicely to please consider an alternative. Of course, this is most likely falling on deaf ears, so Treyarch also has a few words of encouragement for the soon to be weepers. It’s hard to tell if Treayarch is being serious with this post or not. Naturally, the Call of Duty veterans want to hear nothing about taking it easy, trial by fire being the socially accepted learning method of the game’s diehards. However, they do need to say something to keep from alienating a huge market of scared and shivering rookies who can’t handle the actual stress of a virtual battlefield. Just do whatever your heart tells you, folks. I won’t judge you either way.